We all need a treat sometime. But what if a treat could be delicious AND healthy? Is that not just the ultimate vegan paradise? 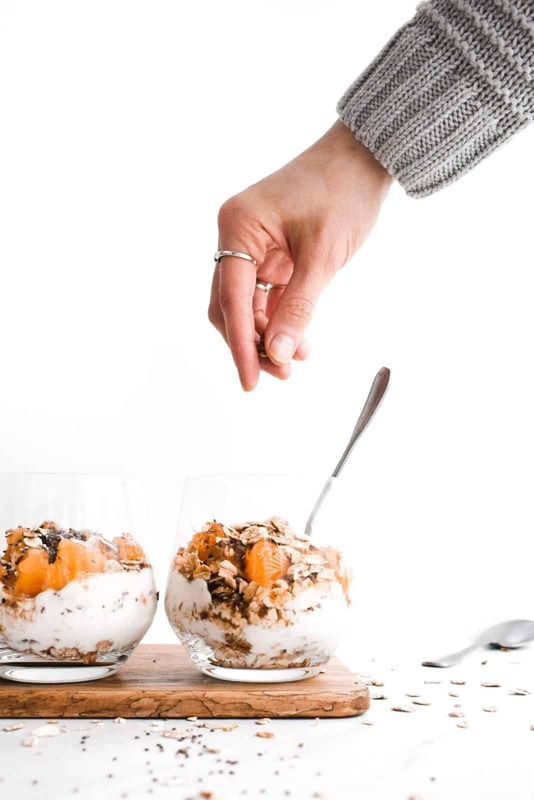 This tangerine yoghurt & fruit parfait provides just that. A nutritious fruity delight with a hint of naughty chocolate shavings. 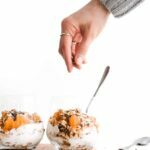 I’ve never been a fan of traditional, dairy yoghurt.It wasn’t until I turned vegan that I started to appreciate its versatility. 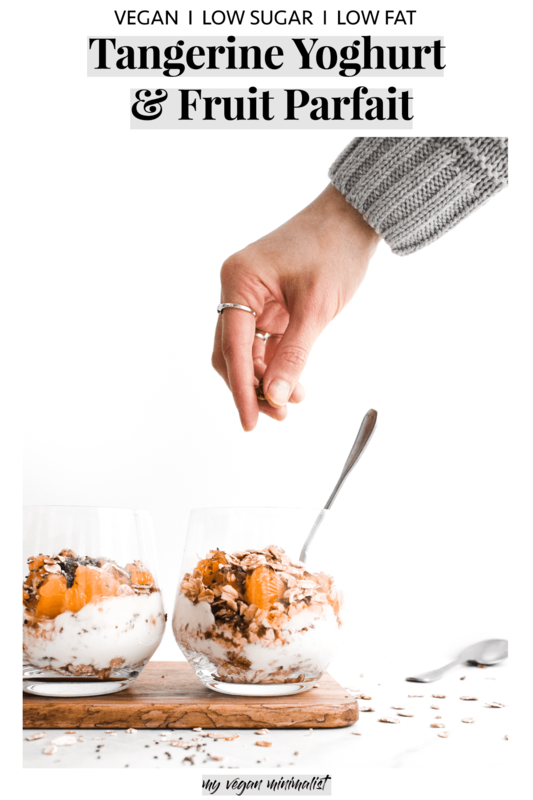 I tried countless vegan yoghurt alternatives and found that a classic, unsweetened soy-based yoghurt is my favourite. It can be used in hot savoury dishes like curries and dhal, as well as to freshen up desserts. If you’ve been following me on Instagram for a while, you’ll know that I love creating vegan desserts. More often than not, I try to maximise their taste whilst minimising the nasties– like unnecessary saturated fat or obscene amounts of sugar. 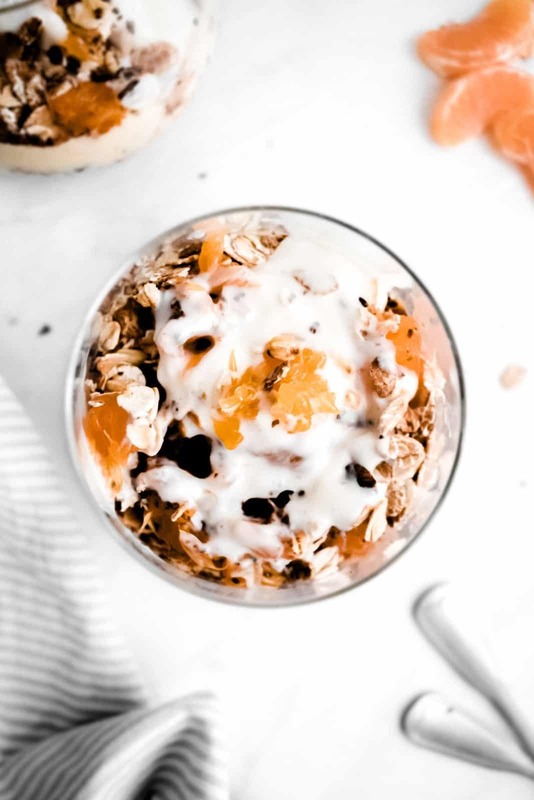 This tangerine yoghurt & fruit parfait is the perfect culmination of my efforts to create a healthy, yet indulgent treat. 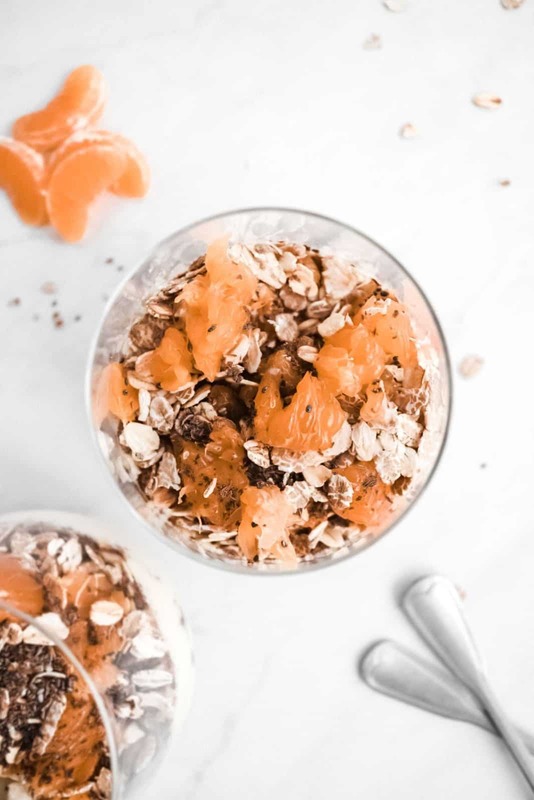 Essentially, its two main ingredients just unsweetened yoghurt (vegan and naturally low in fat) and tangerines. What’s more, it’s also packed with toasted oats and fibre-rich chia seeds. Create alternating layers of yoghurt, fruit and oats. Don’t forget to sprinkle with chia seeds and chocolate shavings in between. If you’re making any variation of my tangerine yoghurt & fruit parfait, it’s important to avoid one common mistake. Don’t let it stand for too long! It’s best to serve it immediately after filling the cups. If not, the toasted oats and chia seeds will soak into yoghurt to create a slimy mixture. And that’s definitely NOT what I was going for when making this recipe. If you’re familiar with My Vegan Minimalist, you will know that my recipes are (nearly) always customisable. I love to provide you with a good all-around base and let you add your own special spark. Is it because I personally can’t be bothered to follow recipes to the dot? Maybe. Is it because I believe different things work for different people? Most definitely. I’ve created several variations of this healthy vegan dessert, using a variety of different fruit options.You could go for fresh raspberries, blueberries or cut up some seasonal strawberries instead. Another great option would be fresh mango. I also find that this yoghurt dessert works best with fresh (not frozen fruit). Last but not least, try avoiding bananas as their pulpy, slimy texture doesn’t provide a big enough kick against the yoghurt base. AND, if you’ve been watching the latest Netflix food hype ‘Salt Fat Acid Heat’, you will know that we need a great balance between various flavours. Want an additional protein punch? Sprinkle with hemp powder!